Brush 4 Hire do some fabulous tau scenery. What really impresses here is that you can select the colour of the forcefields … to match your Tau Sept. Really nice touch. 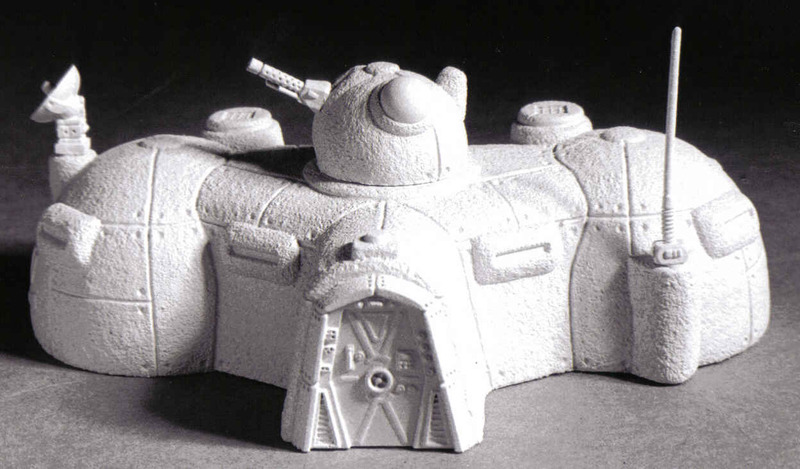 Their bunker looks really good, though if you like a very rounded look for Tau, it might be too hexagonal for you. 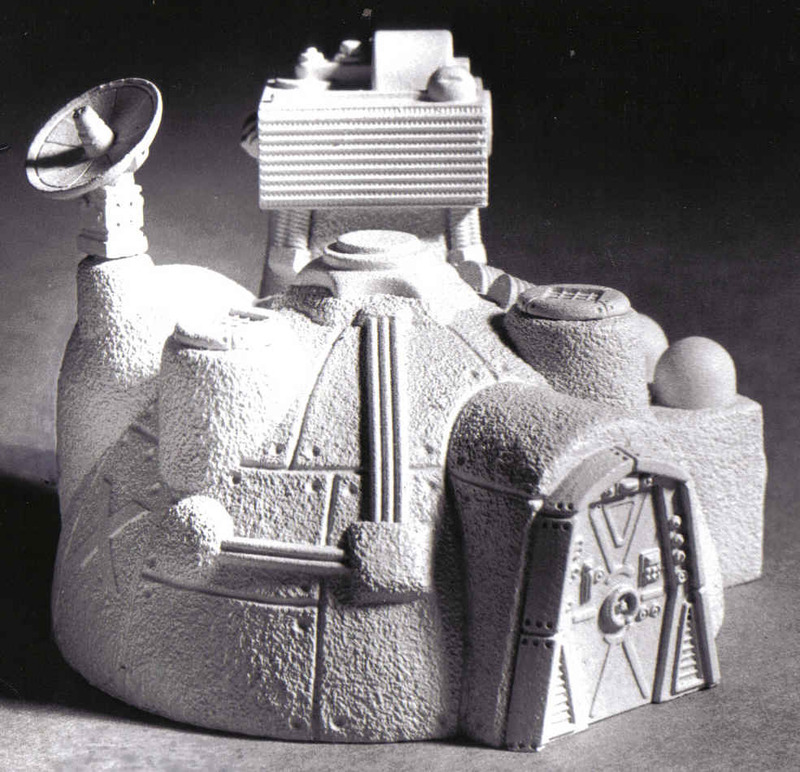 Scotia Grendel have a range of scenery that seems perfect for Tau – their NBO range. Here a couple of examples. But their general scenery would really make a Tau board come to life. Games Workshop make fantastic models, and their Imperial terrain is absolutely superb. Unfortunately, if you don’t want imperial type terrain (or a hill or two), you are pretty much out of luck! Lets take a look at what we can find for terrain for other races, or cheaper alternatives for a home board! 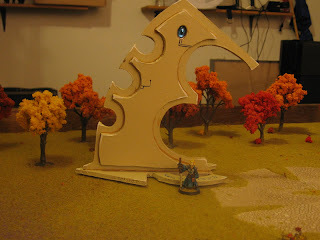 There are some very good Eldar pieces of terrain available on the market at the moment. In addition, their walkways and space modulators are fantastic for people putting together an Eldar themed board. Brush 4 Hire do an interesting range of Aegis Defense Line alternatives, one of which works quite well as an advanced Eldar concept – their forcefield defines line! You can pick the colour of the translucent plastic force shield, to match your craftworld a bit better! Micro Art Studios do a fantastic set of barricades or Aegis defines line too! There once was a template for creating your own webway gate on the GW site, but like much of the old school hobby stuff, this has long since been removed. A retro-engineered version can be found on a here, though! I’m sure there are a few more options out there – I’ll update this post if/when I come across them! Although I haven’t had much hobby time of late, I did get a parcel! It was from a kick starter some time ago / for alternative Aegis Defense Lines! These came from Brush 4 Hire, and I have to admit, look pretty awesome! I have a Minicraft mains powered mini-drill and most of the time its OK, unless you only need to drill one hole or its in soft plastic, I find that the Minicraft is too fast even on low speed for soft plastics – it tends to melt them!, so its back to the old hand drill or it was, enter the Tamiya Electric Handy Drill. Actually it’s battery powered, works at a relatively slow speed, is light and easy to control. 15 or so minutes with screwdriver and pliers got it up and running, a lot easier and more accurate than the hand drill! Found this site with a load of full colour PDF’s with scenery/vehicles for 28mm. Well, the arrival of a small bundle of joy (or wee,spew and poo, depending on how much sleep I got), has had a pretty major impact on my hobby time, but I do want to keep up to date with the dabbling in the gaming hobby that I’m managing! This is the main army list for each force. These models will form the core of any army based around the force. I am building this force to have no more than 1 HQ, 2 Elites, 2 Fast Attack, 2 Heavy Support and 4 troops. This is the 1000pt list expanded to 1500pts, sharing the same base models. You might find some extra upgrades like melta bombs or a few extra troops in an existing unit as well as completely new troops. Again, I’m trying to limit this force to 1 HQ, 2 Elites, 2 Fast Attack, 2 Heavy Support and 4 troops. This is a totally separate 500pt allies detachment, using up to 1 HQ, 1 Elite, 1 Fast Attack, 1 Heavy Support, and 2 troops. These are separate models from those used in the other lists. 1000pt forces ready to go! 1500pt forces ready to go! 1000pt force + 500pt “allies” force from the same codex ready to go = 1500pt force ready to go! 1000pt force + 500pts of actual allies from a different codex ready to go = 1500pt force ready to go! 1500pt force + 500pt “allies” force from the same codex ready to go = 2000pt force ready to go! 1500pt force + 500pts of actual allies from a different codex ready to go= 2000pt force ready to go! 1000pt force + 500pt “allies” force from the same codex ready to go + 500pts of actual allies from a different codex ready to go = 2000pt force ready to go! While there’s a lot of games played at 1750 or 1850pts, the majority of the games I play tend to be at the 1500 or 2000pt marks. The other interesting thing I can do with this is have a self contained “allies” force for various small forces I’ve collected, would like to collect or want to reduce. I have some Imperial Fists that look reasonably good, but at the moment I’m not that interested in collecting a full Imperial fists army, for example. I’m going to set up a 500pt allies list of Codex: Space Marines for them, so I can either field them with other marine forces as part of the main force org, or actually as allies with Imperial Guard. It means I can get use of some of the painted models I have without needing to collect a full army! There will probably be some limitations too – Sisters of Battle tend to be very expensive models in terms of price, but quite low in points, so you need to use more force org slots for them! I probably have to stick to just 1000pt and 1500pt options for them, and use the complete force org. On my first pass through organising my armies and models, I’m using only existing, prebuilt models where possible (I do have a small plastic mountain, particularly for marines, but don’t have time to sort them out at the moment!). Where I can’t build a legal army (I suspect this will be true of my 3rd edition necrons, for example), I will work out the minimum number of models to get a valid list. Not necessarily a good list, but valid lists, and actually assemble the models ready to play in preset KR multicases. That also gives me fixed lists to paint and sort out, in achievable numbers. Again, I’m not going to be looking for Heavy Metal type painting – just rough and ready tabletop. My next post will list the rough armies I need to sort out! With the birth of Lena’s baby girl Nicolia last week, Friday turned into a visit to the hospital so, no gaming work done, still it was good to see Lena and her Mother and Aunt and Nicolia of course! So after swimming on Saturday I pushed the unfinished Napoleonic 20mm Russian infantry to one side and opened the ‘Buildings of Malifaux’ box. Now there are a couple of You Tube videos that show the contents of the box and I suggest viewing those. Also I must point out that to use ‘The Buildings’ you would also need a least one box of ‘Terraclips’ sold seperatly! The instructions on the box are very basic but the system, for the most part is intuitive, that said I would have liked a flyer with some instructions on putting together a structure from the contents of the box! Nice little building and quickly put together, only I used about two thirds of the ‘L’ Terraclips, either I’m going to need loads of boxes of clips (arround 9 quid a box) or putting together single buildings is not the way to go! Putting the buildings together is very easy and with most things with a bit of practice you’ll be able to build very quickly, my only issues are that although the mix of parts in the box seems very comprehensive I’m not sure that you would be able to build the structure shown on the box with the contents also, as a beginner, I’m not sure there is enough gable ends. I used all of the Terraclips ‘L’ clips so, without some redesigning I can’t add any more. Having said that the components are of quality manufacture and represent a very flexible and versitile set, I already have the compainion set ‘Streets of Malifaux’ but need to get another box of Terraclips to be able to use it with the buildings. I plan to ‘play around’ with the current build and will post any updates worth note. Well here we are again, Saturday morning down at ‘Manos’ as – yes we still have no internet 🙁 . The weather is sunny and windy, just as well as the temp. was 32deg at 10:00, ho hum, We’re off on holiday on the 14th for 5 days, just going 90 or so Km down the road to Sitia with some friends (no gardening!!). On the Modeling and Gaming front I have completed the 10mm card ‘Kragenvale Keep’, very nice looking Model I have also produced another keep from Toshach Miniatures from their free offering – will be great to add some variety to the castles in the 10mm campaign. First two pics are the freebe from Toshach the rest are of Kragenvale. For some reason I ended up with a load of ‘Hexon’ base boards in BLACK! not very useful so am in the process of spraying them BLUE! When complete they will give me a 4’x6′ sea area. On the subject of sea I have two 6mm fleets waitng to be painted and a fully based and painted fleet that I got off ebay (from the USA). Got the last part of the new Sisters of Battle Codex in this months WD, after a quick look I dont think that overall the ‘power’ of the army changes too much although the ‘play’ will. Most of the stuff that has been removed I tried not to play as I always prefered a ‘pure’ SoB army. The addition of the command squad adds some flexibility and allows the addition of more heavy weapons (I always needed more heavy weapons). Thats the positive, on the downside I think that overall the reworking of the Codex is just shoddy! It’s a good thing that the ‘sisters play well anyway as this change is primarily a ‘take away’. My personal gripe is the change to the Cannoness who is now a completely bland entry, no option to take the Cloak of St Aspira or a jump pack. Other than Celestine the other ‘characters’ are MALE!! – I will be re-naming those stats and fielding female characters in their place. Overall I prefer the original Sisters of Battle Codex (not Witch Hunters), ho hum. With the new SoB codex now out, I’m keen to try it out and have decided to a re-match between the SoB and DE at The Shrine of St Aspira – see elsewhere on this site. I’m going to play it as a ‘Planetstrike’ scenario with the SoB on the defensive, just need to put together the OB for both sides the DE will be played as ‘Grey’s’ ie unpainted 🙁 but I have a nice narrative go go with it all. While Sue was in the UK I watched the film ‘The Right Stuff’ early US space flight, so now I’m also looking at my stock of spacecraft models in particular the Saturn V/Apollo moon rocket (will be nearly 5 feet tall when built!). Ok lunch has just arrived.